Renowned for its “superb blending of tone, dynamic range, and flexible technique” (Opera News), Etherea Vocal Ensemble is an intimate chamber group specializing in choral repertoire for treble (high) voices. Founded and directed by countertenor Derek Greten-Harrison, Etherea’s debut 2009/10 season included recitals at Lorin Maazel’s Castleton Festival and Yale Institute of Sacred Music. 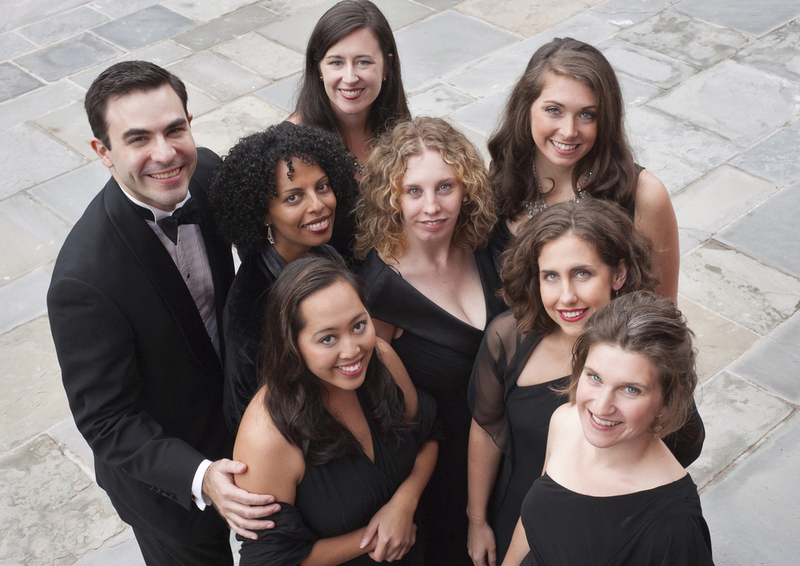 The group has since performed at the Yale Center for British Art and St. Thomas’s Episcopal Church in New Haven, CT, as well as other regional venues throughout Connecticut. New York appearances include First Presbyterian Church (Lockport) and Carnegie Hall’s Weill Recital Hall, both in the 2013-14 season. Etherea’s debut album, Ceremony of Carols, was recorded in collaboration with harpist Grace Cloutier and keyboardist Alan Murchie, and released on the Delos label in November 2011. It quickly became a critical and commercial success, earning glowing reviews, placing near the top of the Billboard Traditional Classical chart for six weeks (peaking at #4), and attaining the #1 Featured Album spot on iTunes Classical. 2013 saw the release of Hymn to the Dawn, a second Etherea album on Delos, which included music by Holst and Mendelssohn in addition to world premiere recordings of works by Beach, Rheinberger, and Rossini. The album debuted at #14 on Billboard’s Traditional Classical chart and #5 on the iTunes Classical chart, and was lauded by such publications as Opera News and American Record Guide. Etherea’s holiday program features Britten’s A Ceremony of Carols, Rutter’s Dancing Day, and traditional favorites of the season; other current repertoire includes music by Beach, Copland, Holst, Mendelssohn, Rheinberger, Rossini, Schubert, Schumann, and Vaughan Williams.